莱茵论坛 第151期 参观活动 – (英文)参观活动 @波恩 2018/11/21 – 波恩大学档案馆参观 回溯历史，细品人文 | Rhine Academic Forum e.V. – Event no. 151 @Bonn 2018/11/21 (English): University Bonn Archive – Visiting event – Rhine Academic Forum e.V. Would you like to learn more about University Bonn’s history of 200 years, and experience history at first hand, while paging through the numerous records of the Prussian students, then living at the beginning of the 19th century? In celebration of University Bonn’s 200th anniversary, the Rhine Academic Forum e.V. 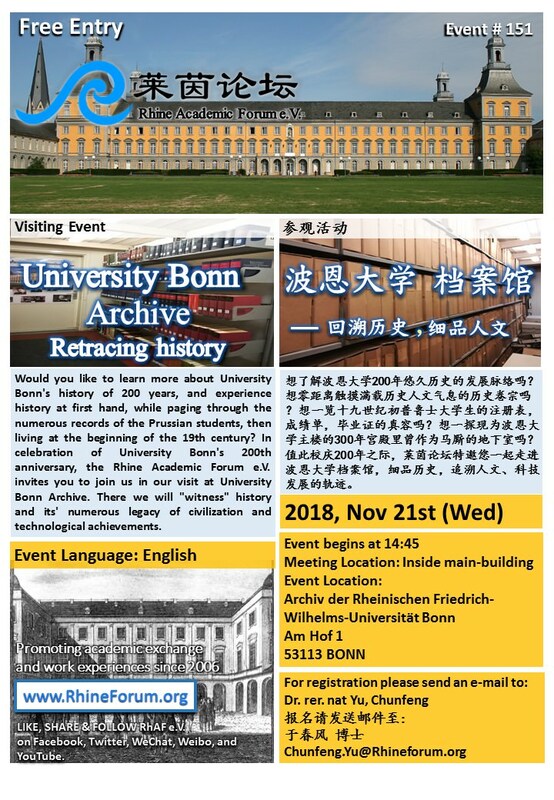 invites you to join us in our visit at University Bonn Archive. There, we will “witness” history and its’ numerous legacy of civilization and technological achievements.